While you can eat garlic every day to take advantage of these benefits, it is easier to take as a supplement. Here is a brief guide to finding the best garlic supplement on the market. Garlic supplements come in capsule form, and when the body absorbs them, the allicin turns into a water and fat soluble sulfuric compound. The compound then enters the hydrogen-sulfide system where it signals the blood vessels to relax. When blood vessels relax, blood circulation and oxygenation improve throughout the body. This improvement helps reduce blood pressure, carries red blood cells where they are needed to fight infections, and boosts the oxygenation of vital organs, like the brain. When shopping for a garlic supplement, check the level of allicin in them. Some preparations, such as garlic oil supplements lose their volatile nutrients due to the heating process garlic undergoes to get rid of the garlic odor. They also don’t have the beneficial water-soluble sulfur compounds. Aged garlic is not made using heat, so it still retains its valuable nutrients. The aging process also helps to get rid of garlic odor, so if you don’t want your breath smelling like garlic, it is a good supplement to choose. Powdered supplements can also be a good choice if they are not heat treated. The heat inactivates the enzyme but retains the alliin on a molecular level. However, to avoid inactivation in the stomach, the capsules should be coated with cellulose. Black garlic contains higher amounts of allicin then white garlic, plus it contains twice the antioxidants and beneficial amino acids. It is naturally odorless, so you don’t need to look for a preparation in which the odor has been eliminated. Here are some of the top 10 garlic supplements from which to choose. 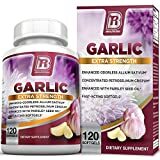 When selecting the top garlic supplements for this review, we examined testimonials and the ingredients in them to ensure the best supplements were chosen. We then gave the supplements a star rating from one to five stars, with five being the highest rated supplements. Here are the 10 best garlic supplements to consider for their health benefits. No wheat, no soybeans, no dairy, no egg, no gluten, no fish/shellfish, no peanuts/tree nuts. Pure Mountain garlic supplements contain certified organic garlic and are certified as kosher. That makes these supplements suitable for vegetarians and anyone who eats kosher diets. Along with no dairy or animal products, these capsules do not contain peanuts or tree nuts, wheat or soybeans. The garlic undergoes a careful process to retain the nutritional compounds of raw garlic. The supplements are also produced without using preservatives, fillers, flowing agents, GMOs, Magnesium Stearate or Sodium Benzoate. The manufacturer offers a no questions asked, 100 percent money back guarantee if you’re not satisfied with their product. This supplement can be taken up to three times a day and contains 500 mg of garlic. The Kyolic garlic supplement is aged organic garlic that has been processed to eliminate the odor. Although the process gets rid of the smell, it retains its nutritional benefits and creates others. The aging process lasts for 20 months, so it helps bring out the nutritional benefits of the garlic. This formula also contains lecithin, which is an essential nutrient for the body and is found in cells. It helps to reduce cholesterol, but it is also used to treat dementia, such as Alzheimer’s. Aged garlic products have undergone multiple peer-reviewed studies to attest to their benefits. When taking Kyolic, you don’t need to worry about having garlic on your breath since it is an odorless formula that retains its beneficial nutrients. Along with dementia and cholesterol, this product may treat depression, anxiety, eczema, and liver disease. This aged black garlic supplement contains 800mg of black garlic powder, along with 1.2mcg of S-Allyl-Cysteine. This compound is a stabilized, potent antioxidant that is absorbed in the body better than allicin in garlic. It regulates blood pressure, boosts immunity, and helps improve heart health. To form the supplement's powder, the black garlic is left out to oxidize and then crushed. It is then encapsulated in a GMP, or Good Manufacturing Practices facility, which is registered with the Food and Drug Administration. These capsules are vegan, and they do not contain GMOs or gluten. The recommended dosage is two per day, and each bottle has a 30-day supply. The manufacturer provides a 30-day money back guarantee if you are not satisfied with this product. This garlic supplement contains 5,000mg of garlic per tablet, so you only need to take one per day to get the daily recommended amount of it. It provides the same amount of allicin as four cloves of garlic. 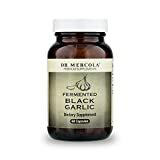 The supplement has an enteric coating, which passes through the stomach to the small intestine to help avoid garlic breath. The coating also acts to release the two compounds that create allicin slowly, so you get the beneficial advantages of it. The tablet does not contain aged garlic, just regular garlic. Each package includes a 30-day supply of tablets to help support heart health and was chosen as a top 10 best garlic supplement. 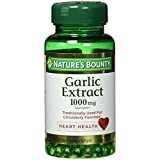 Nature's Bounty garlic supplements that were chosen for this list are soft gels designed for rapidly releasing its beneficial nutrients. To maintain the beneficial amount of allicin, the garlic undergoes a cold process to eliminate odor. The amount of garlic in them is equal to 1000mg of fresh garlic bulbs. These soft gels are made to support heart health and provide better blood circulation. This supplement is available in three sizes, a package of four bottles, a pack of five, and a pack of six bottles that contains 1000mg soft gels. GREAT GARLIC! : GarlicRich is a natural source of cardiovascular and immune support in a enteric-coated softgel. GOOD FOR THE BLOOD: Supports lower cholesterol, healthy blood pressure, and improved circulation. A CLOVE OF HEALTH: Promotes a balanced immune system by protecting against bacterial and fungal infections. 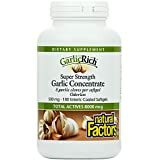 This Natural Factors Garlic Rich supplement contains 500mg in each soft gel of garlic and 8,000mcg of alliin and allicin. Each one also includes the equivalent of eight cloves of whole garlic. However, its processing method leaves out the odor while maintaining the benefits of garlic. It is designed to help reduce blood pressure, increase blood circulation, and lower cholesterol. Garlic Rich also helps to protect against infections, whether they are bacterial or fungal. The gels have an enteric coating, so they bypass the stomach to go into the small intestine to release their ingredients into the bloodstream. The aged, fermented garlic provides a sweet taste, and the process helps to create other nutrients, like SAC or S-allyl-cysteine. The development of SAC is essential for receiving the benefits from black garlic. Since black garlic is odorless, you needn’t worry that your sweat or your breath will smell like garlic. The black garlic is double-fermented to make use of its natural bacteria to benefit the user. It is also freeze-dried, so the product remains stable and can have a shelf life of about a year and a half. ZHOU Extra Strength garlic supplements contain 5,000mcg of allicin in every tablet. The process for making these tablets ensures that the allicin is salvaged and that the tablets are odorless. The allicin is saved by providing an enteric coating so that the tablet moves through the stomach and into the small intestine before breaking down. The tablets are made without the use of GMOs, soy, milk, eggs, fish, shellfish, tree nuts, peanuts, wheat or animal products. The exclusion of these ingredients makes them suitable for vegetarians and vegans to take for their health benefits. Along with immune and heart support, garlic can help prevent cell damage and provides antioxidants that fight free radicals that lead to aging. A bottle of the ZHOU Extra Strength Garlic contains a three-month supply. BRI Nutrition processes their garlic supplements to provide odorless garlic. You won't burp garlic once the supplement has dissolved in your stomach acids. Along with the garlic, each capsule contains 200mg of parsley oil to keep your breath fresh. Their 1,000 mg soft gel capsules rapidly release beneficial allicin into your system. Their supplement promotes cardiovascular health, controls cholesterol levels, improves the immune system, and has detox capabilities. They recommend taking two soft gels per day to reap the benefits of the garlic supplement. If you're not satisfied with their product for any reason in the first 60 days, they offer a 100 percent money back guarantee. This Bio Life garlic supplement comes in soft gel capsules, which are easier to swallow than tablets or other types of capsules. Along with 1,000mg of garlic, each capsule also contains 200mg of parsley. The addition of parsley helps to keep breath fresh, promotes good digestion, and provides beneficial antioxidants. Along with promoting heart and cardiovascular health, garlic fights cell damage throughout the body. Garlic is considered a superfood, so it has multiple benefits when it is consumed. 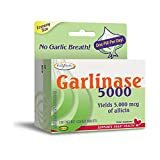 However, if you don’t want smelly breath or body sweat, then you can take this odorless garlic supplement to better your health. A doctor may recommend purchasing a garlic supplement to protect your heart health, brain health, and to improve blood circulation. There are dozens of garlic supplements on the market, so it can be difficult to choose the right one. To select a good supplement, you need to read the label to ensure it contains allicin, which is essential for releasing the benefits of garlic. Avoid garlic oil supplements and those that have been heat treated, like some odorless supplements have been. Aged garlic supplements are a good choice because heat isn’t used to process the garlic. Heat causes garlic to lose its nutrients, including essential allicin. However, the aging process reduces the odor in garlic, so it doesn’t leave you with bad breath or come through your skin when you sweat. Black garlic supplements are another good choice because black garlic is naturally odor-free. They also contain several vitamins and minerals essential for maintaining good health. S-Allyl-Cysteine is essential to draw out the benefits of the garlic, so when you read the label, make sure it has at least 1.2mcg of the compound. Look for supplements that say they produce allicin to avoid them. When tested in water, they were able to produce allicin, but when tested in vinegar, which is closer to the pH balance in your body, not enough was produced to be effective. 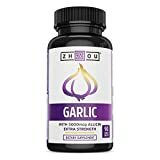 The best garlic supplement will contain garlic powder from crushed fresh garlic or aged garlic, so it contains the compounds that help create allicin. Reading labels on supplements can help you discern how they are made and their ingredients to ensure you are getting an effective product. Garlic supplements have several benefits that can help reduce heart problems, high blood pressure, boost the immune system, and provide antioxidants to fight against damage to your body’s cells. With this information and our choices for the top 10 supplements, you should be able to find one to fit your needs.